In The 95% Vegan Diet, Jamie Noll empowers her readers to live healthier lives by following a mostly plant-based diet. However, despite its health benefits many people don’t consider this way of eating as realistic or desirable. They can’t imagine giving up some of their favorite foods forever and don’t want to maintain a strict regime. Luckily, people can still get the benefits of a healthy vegan diet without demanding 100% perfection. A more practical alternative is to follow a 95% vegan diet. People generally fail at dieting when they try to implement extreme changes they cannot follow in the long-term. You will be much more successful if you strive toward a 95% goal. In the long run this will give you better results than trying to adhere to a strict diet. 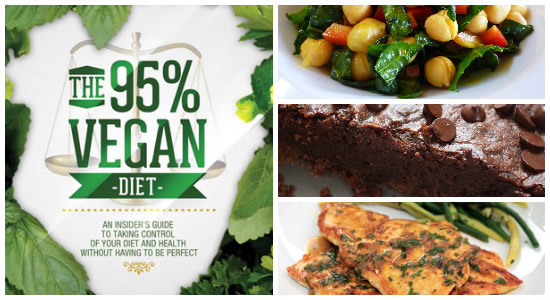 95% Vegan includes a seven-day meal plan designed for those new to a plant-based diet. It was created to show you that you don’t have to radically alter your daily choices. However, you are encouraged to create your own vegan weight loss meal plan. This is because it is important for your health goals to understand how to devise a healthy vegan diet. The knowledge you gain about nutrition will help you maintain a healthy diet for the rest of your life. Many of your favorite meals can become vegan with just a minor adjustment or two. The book includes advice on recipe substitutions along with a collection of vegan recipes. Tofu, tempeh, seitan, textured vegetable protein, vegan cheese, vegan butter, soy milk, almond milk, rice, cashews, tahini, peanut butter, coconut cream, kidney beans, chickpeas, spinach, broccoli, tomato, carrots, oranges, pineapple, blueberries, flaxseed oil, olive oil, liquid aminos, nutritional yeast. Good nutrition needs to be balanced with the other elements of a healthy lifestyle including exercise. Regular physical activity helps control your blood pressure, lipid levels, and improves your mood. It can also reduce levels of C-reactive protein (CRP), a marker of internal inflammation associated with cardiovascular events. The 95% Vegan Diet: An Insider’s Guide to Taking Control of Your Diet and Health Without Having to Be Perfect retails at $24.99. Plant-based diets have been scientifically demonstrated to reduce the risk of heart disease, diabetes and cancer. Provides a more realistic option for most people than following a strict vegan diet. Educates readers about how to improve health with optimal nutrition. Offers advice on eating a vegan diet on a budget. Encourages consumption of processed soy foods, which are usually made from genetically modified soybeans. A lot of dieters will not enjoy the flavor and texture of meat and cheese substitutes. Many of the recipes include unhealthy ingredients such as white flour, sugar, corn syrup and vegan butter. This book is designed as a resource to educate you how to eat a plant-based diet without demanding 100% perfection. It offers a plan that is more realistic so you can stick to it for the long haul. You can be 95% vegan and enjoy flexibility in your diet while still losing weight and improving your health.